Southern senior Ryan Mills (55) sacks Red Devils quarterback Max Hilton, during the Tornadoes’ 35-19 victory on Friday in Ravenswood, W.Va.
Southern senior Auston Colbun (67) recovers a fumble in front of RHS sophomore Joe Chambers (27), during the Tornadoes’ 35-19 victory on Friday in Ravenswood, W.Va.
RAVENSWOOD, W.Va. — A rivalry is born. 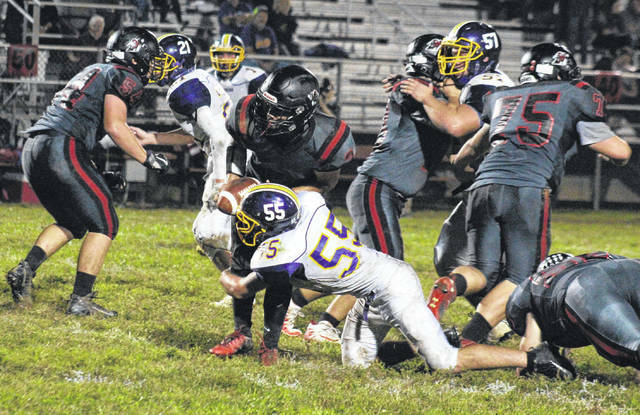 The Southern and Ravenswood football teams met for the first time on the gridiron at Flynn Field on Friday night, with the Tornadoes rolling to 390 yards of offense and a 35-19 victory. Southern (6-1) got the ball first and needed less than two minutes to break the scoreless tie, covering 65 yards in eight plays. With 10:04 left in the first quarter, Logan Drummer tossed an 11-yard touchdown pass to Brody Dutton, and then kicked the extra point to give the guests a 7-0 lead. The Red Devils (2-4) had to punt after six plays on their first drive, and Dutton returned the kick 71 yards for a touchdown. Drummer found Weston Throla on a two-point conversion pass, giving SHS a 15-0 advantage with 7:00 left in the first. Ravenswood cut its deficit to seven points less than a minute later, as Chase Hood broke a 69-yard touchdown run, and Tanner Snodgrass followed with the extra point. The Tornadoes had to punt for the first time after seven plays on their next possession, but Auston Colburn recovered a RHS fumble on the play, restoring possession for the guests. Five plays later, the Red Devils came up with a takeaway of their own, as Max Hilton intercepted a pass on the RHS nine. Ravenswood made it 29 yards before being forced to punt, and Southern’s offense took over with 9:46 left in the half and 71 yards to paydirt. The Tornadoes moved across midfield on the sixth play of the drive, with Drummer rushing for three yards to complete a fourth down conversion. Five plays later, the Drummer found Gage Shuler for a 31-yard touchdown pass, that gave Southern a 22-7 lead with 5:18 left in the half. The Red Devils went three-and-out on their next possession, but Southern fumbled on the punt return and RHS recovered near midfield. Still on the 50 after two plays, Hood took the third down hand off all the way to the end zone, but the Tornadoes stopped the two-point conversion to keep their lead at 22-13 with 1:58 left in the half. The remainder of the first half featured a trio of turnovers, including interceptions by Thorla and Hilton, and the Tornadoes headed into the break with a nine-point edge. Defense ruled the third quarter, as each of the first four drives resulted in a loss of downs. Ravenswood broke the offensive drought on the second play of the fourth quarter, as Sam Sturm scored on a nine-yard quarterback keeper. The RHS point-after kick caromed off the goal post, and Southern held a 22-19 lead with 11:29 to go. Southern made it 35 yards on its next drive, but penalties caused the drive to stall out at the 50. The Purple and Gold defense came up with a three-and-out, however, and Southern regained possession at its own 26. On the third play of the drive, Drummer found Trey McNickle for a 54 yard pass, and two plays later, the duo hooked up for a 10-yard touchdown. Drummer’s extra point kick gave the guests a 29-19 lead with 4:49 to play. Ravenswood lost possession on downs after just four plays on its ensuing drive, and Southern took over at the RHS 26. The final touchdown of the night came with 1:47 to play, as Drummer tossed an 11-yard pass to Thorla. Following the victory, Tornadoes head coach Cassady Willford talked about how big this victory was for his team, especially coming against against former SHS assistant coach and current RHS head coach Eric Hupp. “This win is very important to us,” Willford said. “Coach Hupp has a great ball club here, they’re well-coached and very disciplined. With him being a coach of our kids before, it was a special night for our guys. Coming across the river, playing in the Friday Night Rivals Game of the Week, the lights, the fans, the TV, it was a lot for our guys to handle. 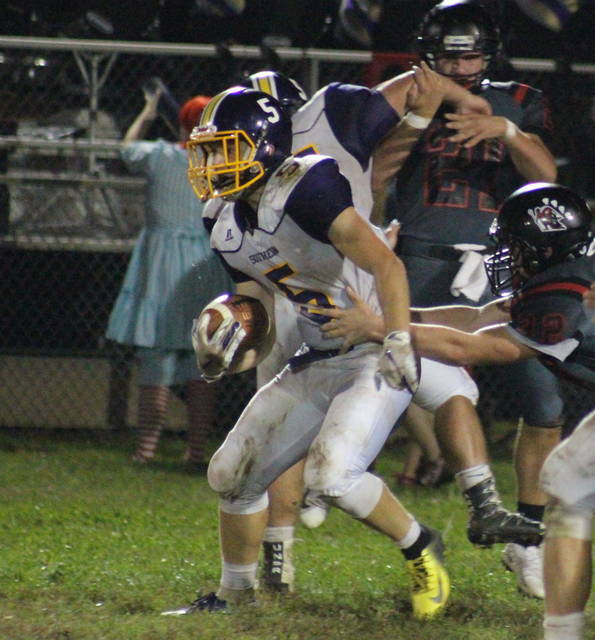 The Tornadoes enjoyed a 390-to-295 advantage in total offense, including 261-to-26 in the passing game. Southern lost the turnover battle by a 4-2 tally, but doubled up Ravenswood to the tune of 22-11 in first downs. Both teams were penalized nine times, with SHS being sent back 65 yards and RHS losing 85 yards. McNickle — who received Player of the Game honors postgame — led the Tornadoes in both rushing and receiving, carrying the ball 15 times for 80 yards, while hauling in five passes for 71 yards and a touchdown. Drummer — who carried the ball 11 times for a total of 14 yards — was 19-of-32 passing for 261 yards and four touchdowns. Shuler carried the ball five times for 35 yards and caught four passes for 50 yards and a score. Austin Baker had four receptions for 46 yards in the win, Dutton hauled in three passes for 45 yards and a touchdown, while Thorla earned 43 yards and a score on three grabs of his own. Hood led the Red Devils with 158 yards and two touchdowns on 17 carries, while catching one pass for 21 yards. Jacob Anthony had 40 yards on seven totes, Luke Jackson added 33 yards on six carries, while Wayne Stephenson earned 27 total yards on three carries and one catch. Hilton was 2-of-6 passing for 26 yards, while gaining 12 yards over seven carries. Sturm finished with 18 yards and one touchdown over seven carries in the setback. The Purple and Gold will head to Waterford in Week 8, where the Wildcats wait with a 5-2 record. 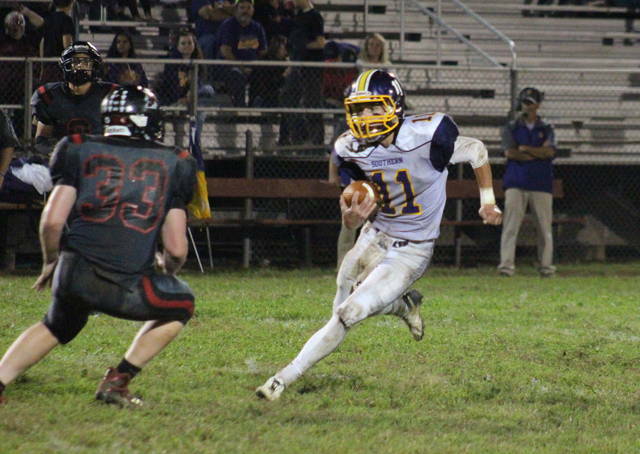 Ravenswood will try to snap its four-game skid at unbeaten Doddridge County.